Tired of remaining nameless in his new home of Montgomery, AL, Willie Spade decided he had to make a change in his genre of music and find different ways to showcase his wordplay skills. So began the Gump Gumbo project. A mix-tape that heavily catered to the southern hip-hop genre, completely abandoning the sound of The Urban Renaissance. The mix-tape is compiled with songs from his previous projects The Famine & The Civil War: North v.s. South, as well as freestyle over industry instrumentals, diss tracks, and a slew of fresh new tracks. The Mix-tape helped establish a name to a once nameless emcee, leading to him working with 2 Face, Rivah $ity Rydaz, L-Gin, Jungle Baby, Ala-Mob amongst other well known Alabama Artists and Groups. Spade had insisted this doesn’t display his best wordplay ever, but showcases his ability of being a songwriter. This album has been deemed a classic by critics and the stepping stone to the Gambit Family Brand. Posted by Adminstrator in Solo on February 9th, 2014. 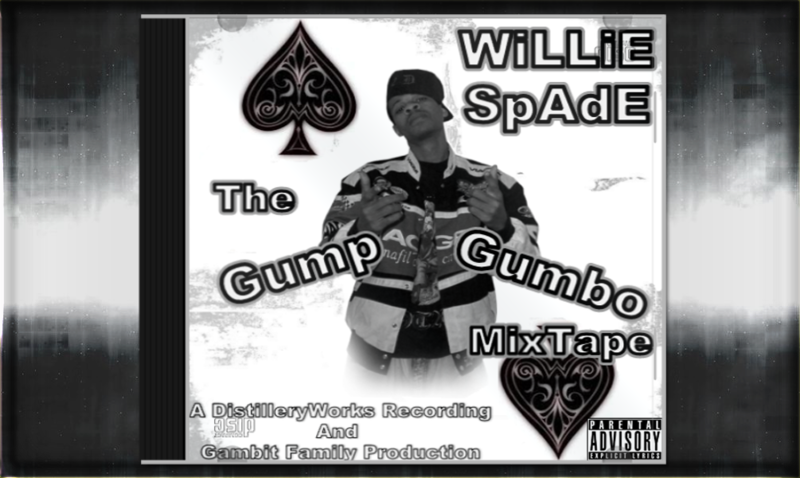 This post has Comments Off on Willie Spade: Gump Gumbo.